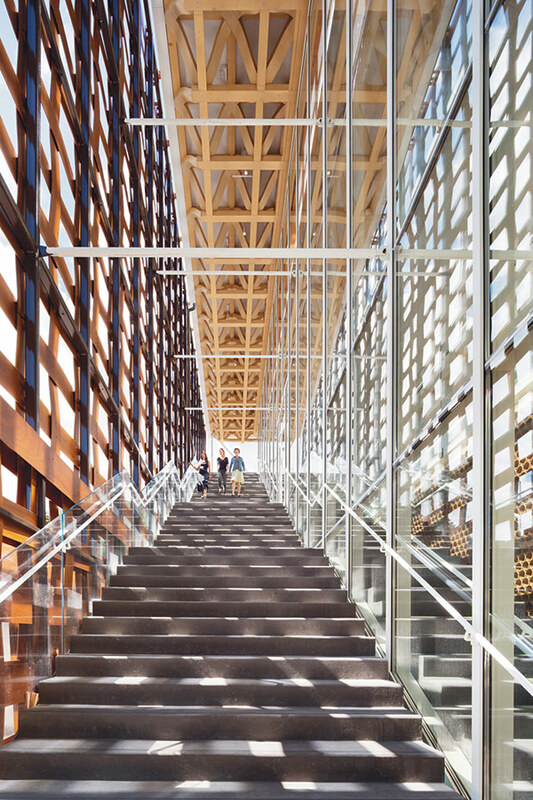 Lauritzen Outpatient Center by HOK. Patients have described Nebraska Medical Center as a maze, which can make navigating the campus a challenge. The University of Nebraska melds with Clarkson and University Hospitals, coming together at a point just west of downtown Omaha. 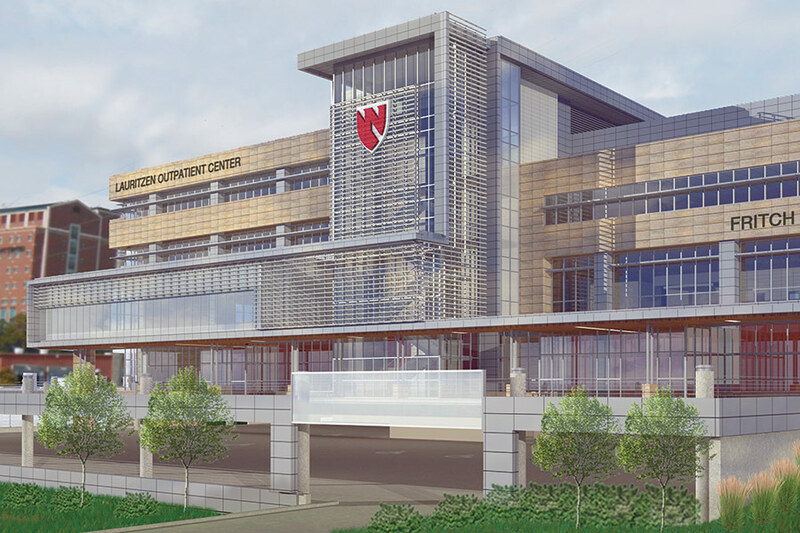 Soon patients making the trip for same-day operations and services will be able to streamline that journey, once the four-story Lauritzen Outpatient Center is complete in August 2016. “The goal is to create a one-stop shop for outpatient services, focused on outpatient surgery procedures,” Rosanna Morris, the hospital’s chief operating officer, told Livewell Nebraska. 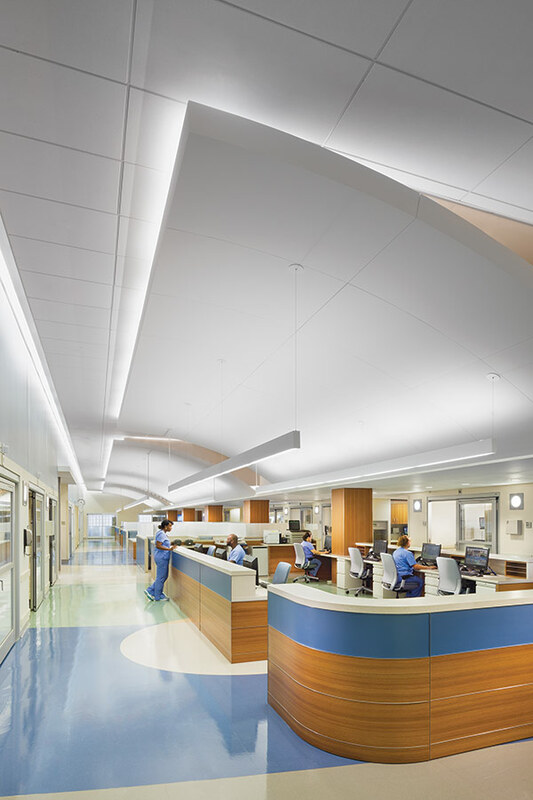 At 165,000 square feet, the building is anchored by 12 outpatient surgical suites. It also includes flexible clinic space with universal exam room layouts. Radiology and pharmacy services will be provided, as well as occupational and physical therapy. Clinical spaces will comprise almost 200,000 square feet, with structured parking tucked beneath the building. The latest addition to Omaha’s sprawling medical campus, now under construction, is a facility dedicated to outpatient services. 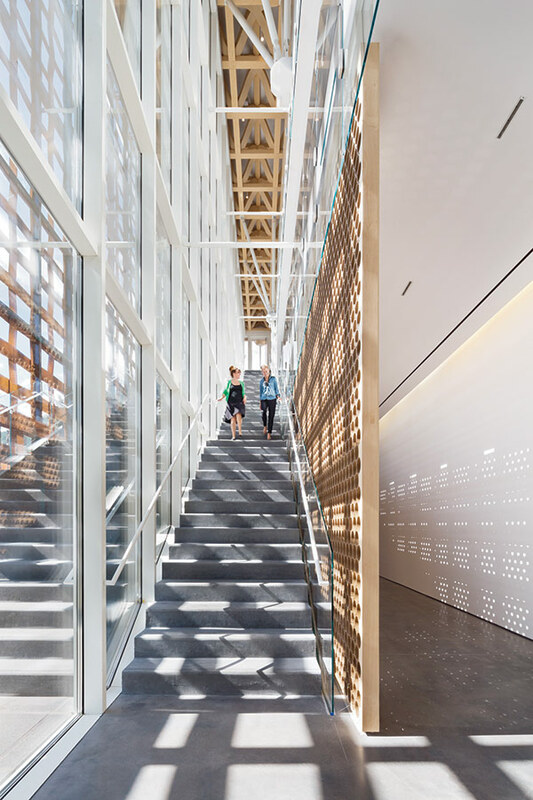 Architects at HOK and RDG worked to streamline wayfinding in the four-story building, adding separate elevator bays for patients entering and exiting. “One of the key challenges of the project is the patient experience,” said HOK’s senior medical planner, Kerry Cheung. The building’s massing is organized around a central volume that houses three separate elevator bays and puts forth a glassy, south-facing public front. Cheung said the layout allows patients to intuitively find their way from the main elevator core to wherever they’re going. The southern elevators serve patients entering the building and traveling to care facilities, while another bay serves back-of-house activities and staff transport. A third elevator core offers patients leaving after surgery and check-ups to bypass the waiting rooms and other areas they might have to backtrack through in other hospitals. To further aid wayfinding and the patient experience, designers worked with the client to consolidate clinic space, from orthopedics to physical therapy, alongside medical imaging. Unlike in older healthcare facilities, where getting an x-ray often requires an odyssey to another part of the building or even another address, Lauritzen doctors will be able to easily refer patients down the hall. “One of the key reasons for us being able to do that is that everyone came together and decided that’s the best way to serve the patient,” said Cheung. That new building will also allow the hospital to consolidate outpatient surgery rooms from University Tower and repurpose that space. HOK is collaborating with RDG on the project, and MCL is the contractor. Construction on the new facility began this fall. 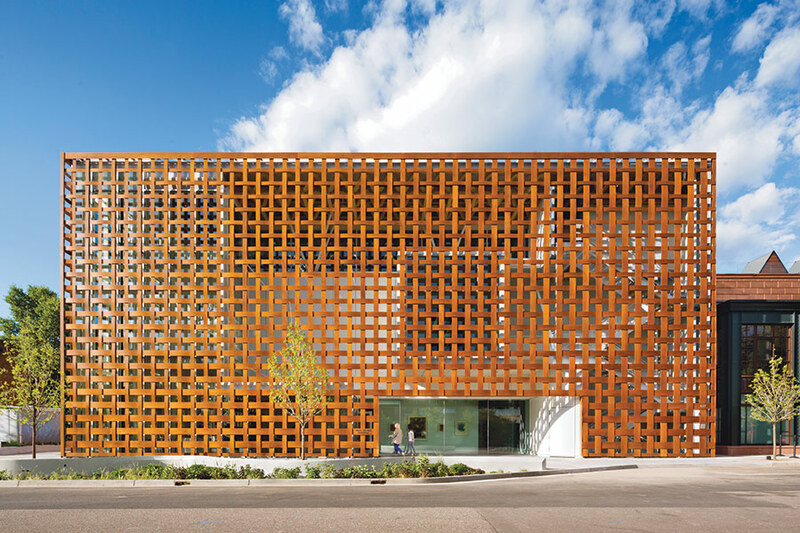 Perkins Eastman transformed Albert Ledner’s quirky O’Toole building into a bright and efficient emergency department. The sudden closure of St. Vincent’s hospital in Greenwich Village left lower Manhattan with a serious shortage of emergency room capacity. At the same time the Albert C. Ledner-designed O’Toole building, located in a New York City landmark district, stood empty; its quirky forms and layout (thankfully) resistant to easy condominium conversion. Following a national trend toward smaller, faster outpatient care centers, North Shore-LIJ purchased the building to create Manhattan’s first stand-alone emergency department, which opened late this summer. The idea behind these stand-alone emergency centers is to improve care and lessen wait times by concentrating services for the vast majority of emergency room visits, including an X-ray, CT, and MRI imaging center, ultrasounds, and ambulatory surgery, all of which are for outpatient treatments. Patients requiring long-term care are transferred to a traditional hospital (EMTs make a determination in the ambulance about which facility is best suited to the patient’s needs, or the patient can request a specific hospital). “It’s a faster way to deliver care,” said Frank Gunther, a principal at Perkins Eastman, the firm that lead the adaptive reuse project. 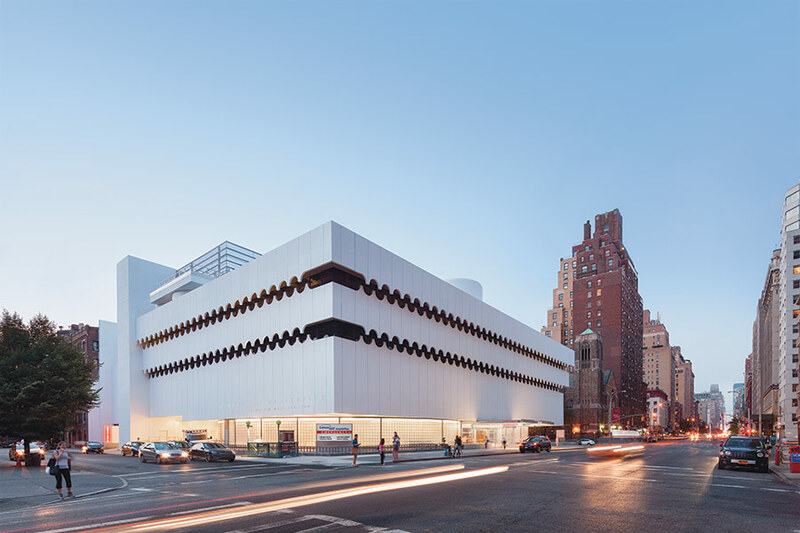 The architects worked with the Landmarks Preservation Commission and New York’s State Historic Preservation Office to update the building’s distinctive top-heavy exterior. They removed white tiles that had been added to the exterior and tested the concrete underneath to determine the exact shade of white stain Ledner had used. 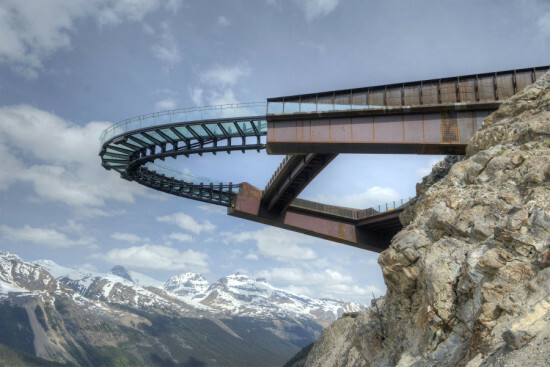 They created a new glass entry pavilion with a cantilevered glass canopy that extends out to the sidewalk, which opens up the otherwise opaque building to the street. 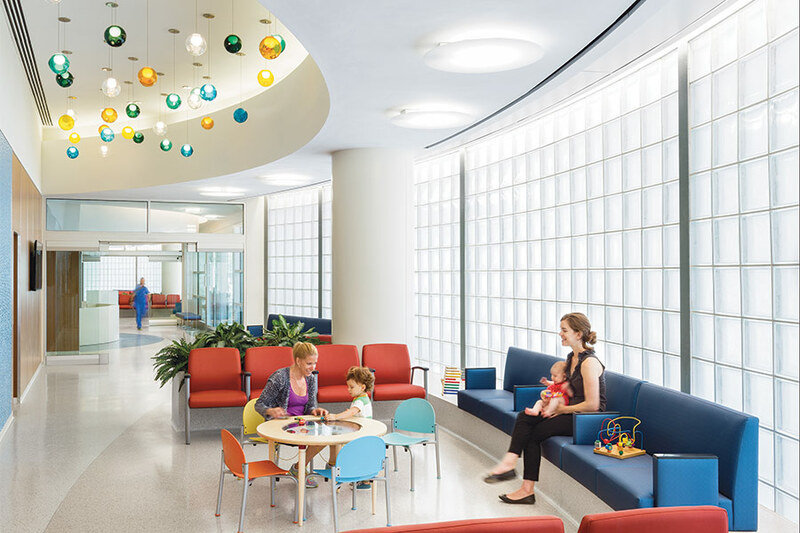 Once inside, visitors encounter unusually small waiting areas, which flank the entrance—the proof of the in-and-out, patient-centered approach. 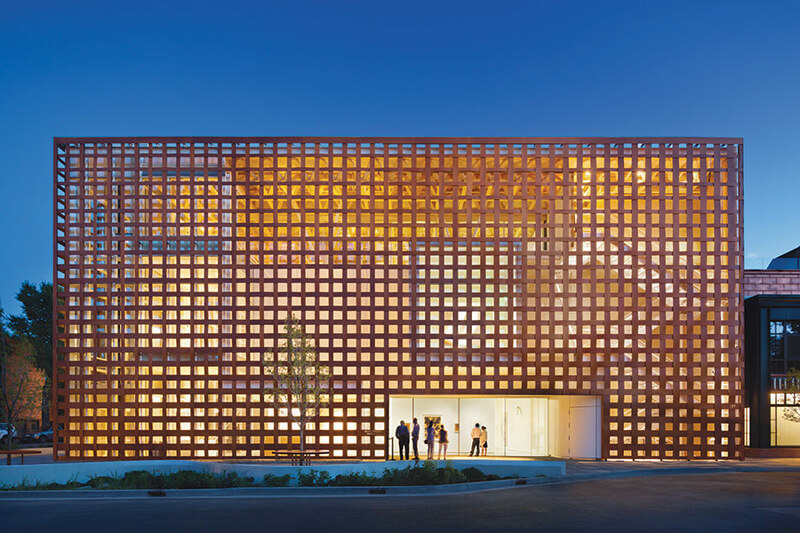 Twenty-six exam rooms are arranged around the perimeter with access to natural light through the translucent glass block walls. In the center, a “results waiting area” with semi-private cubicles is bounded by two nurses stations, putting patients and care-givers in immediate proximity. 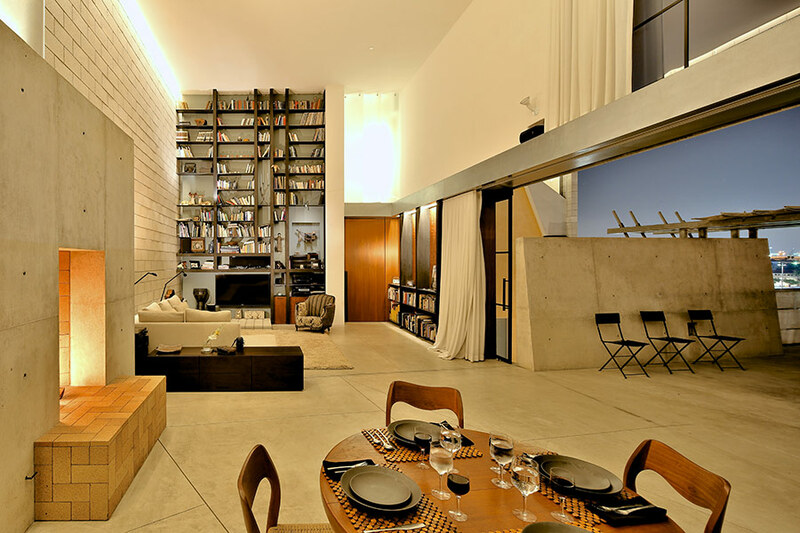 The interiors are bright and uncluttered, cheerful yet serene. Responding to community demographics and needs, the facility also has a dedicated unit for treating victims of sexual assault and a decontamination unit for disaster preparedness, which are segregated from the walk-in areas. Staff offices and an ambulance reception area are located in the basement. The upper floors are being developed into medical offices. 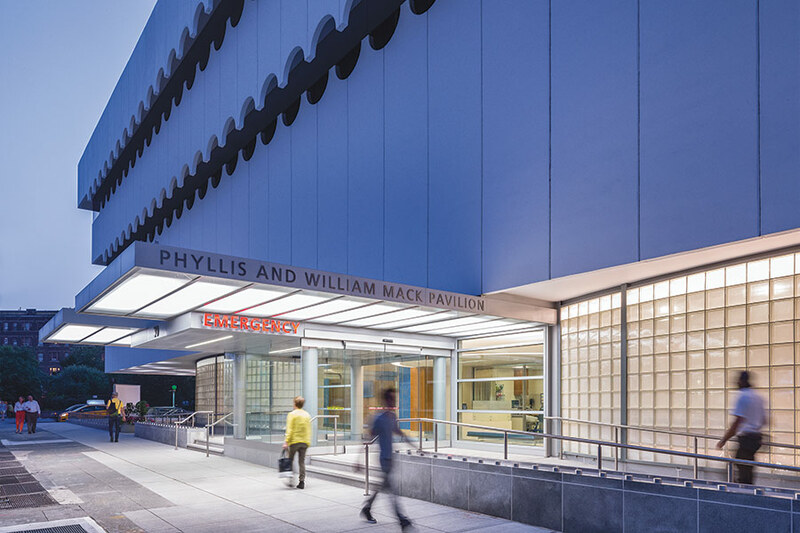 The new facility serves a crucial role in the lower Manhattan community, and the efficient design helps make a trip to the emergency room both a shorter and more pleasant healing experience. 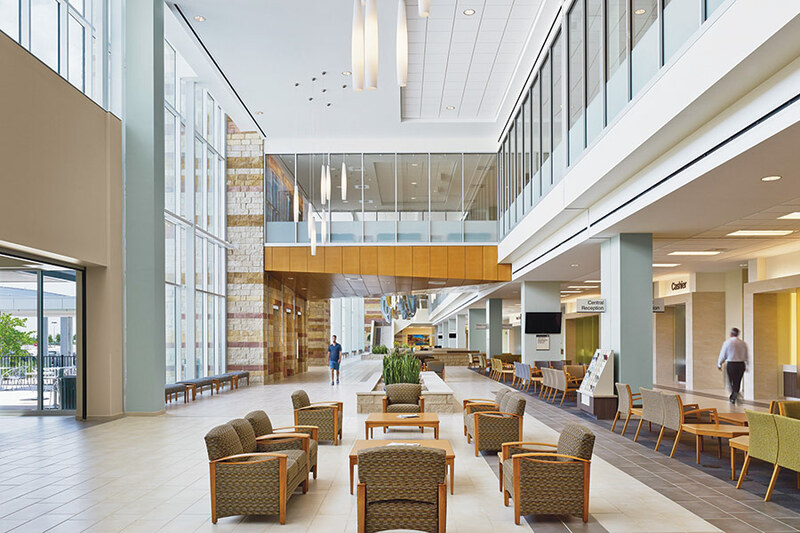 Page’s Austin VA Outpatient Clinic was designed according to the principles of evidence-based design. 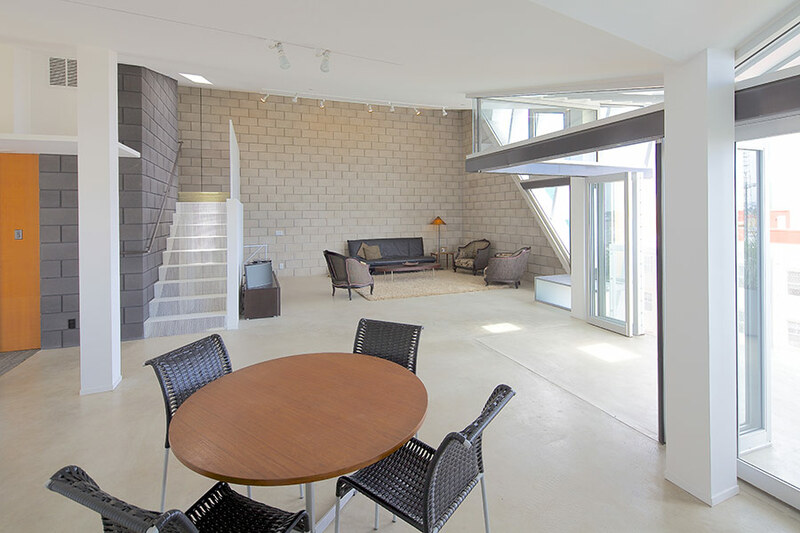 Natural materials were used throughout the exterior and interior, and daylight and views to the surrounding landscape were provided in all appropriate spaces. 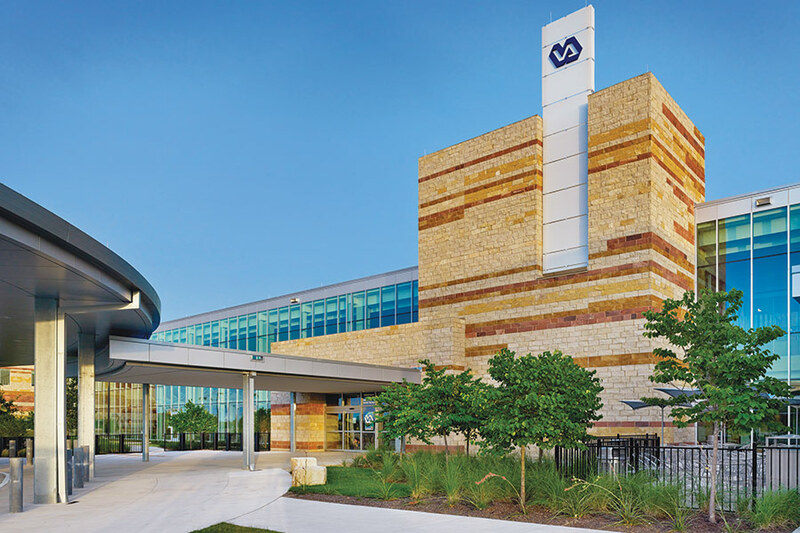 At 260,000 square feet, the Austin VA Outpatient Clinic is the largest of the U.S. Department of Veterans Affairs’ freestanding outpatient centers. Built to replace a facility that was a quarter of its size, it provides greater capacity to serve the new generation of veterans from the nation’s recent foreign wars. It also consolidates all of the outpatient services that could conceivably be needed—from primary care to minor surgery—under one roof, so local patients do not have to travel to VA installations in other towns. 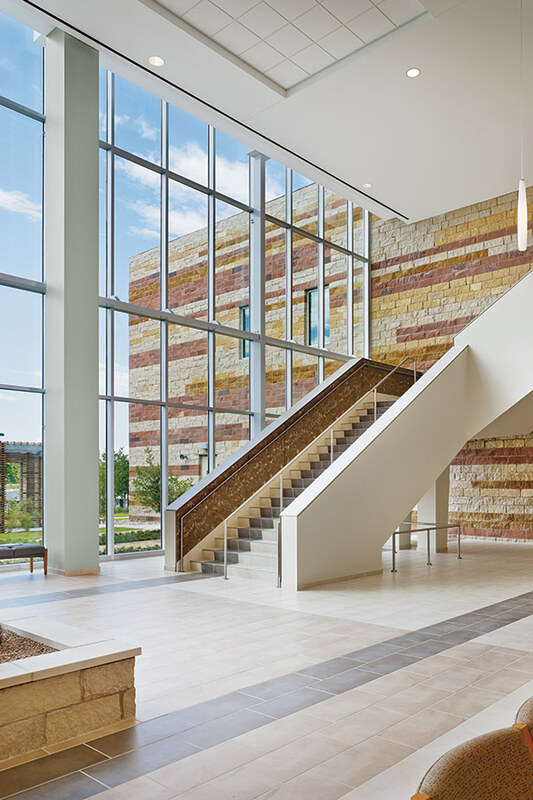 Sited in a suburban office park not far from Austin Bergstrom International Airport, the architects looked to nearby McKinney Falls State Park to find inspiration for the building’s formal language and materiality. 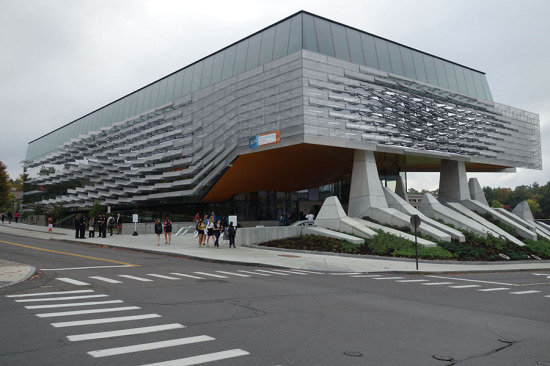 VA design guidelines called for CMU on the exterior. 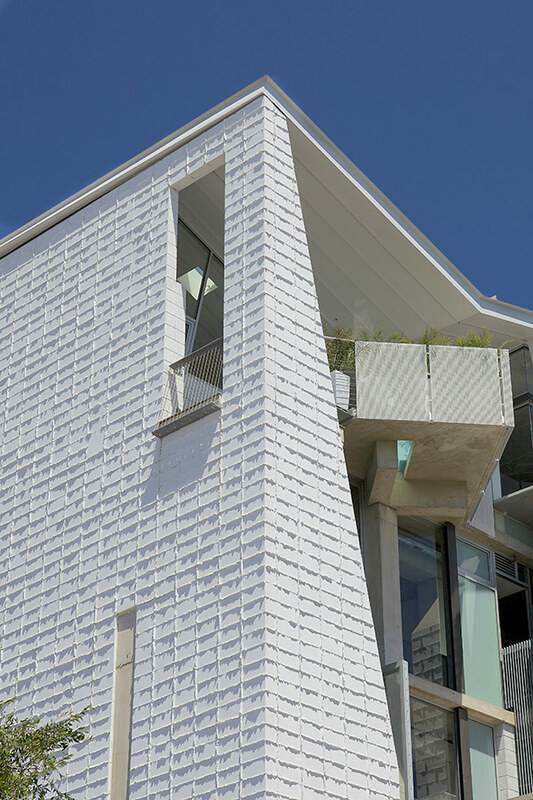 Page instead recommended using split-face blocks of local limestone in four different colors arranged in a horizontal, strata-like pattern reminiscent of the rock escarpments of the Texas Hill Country. 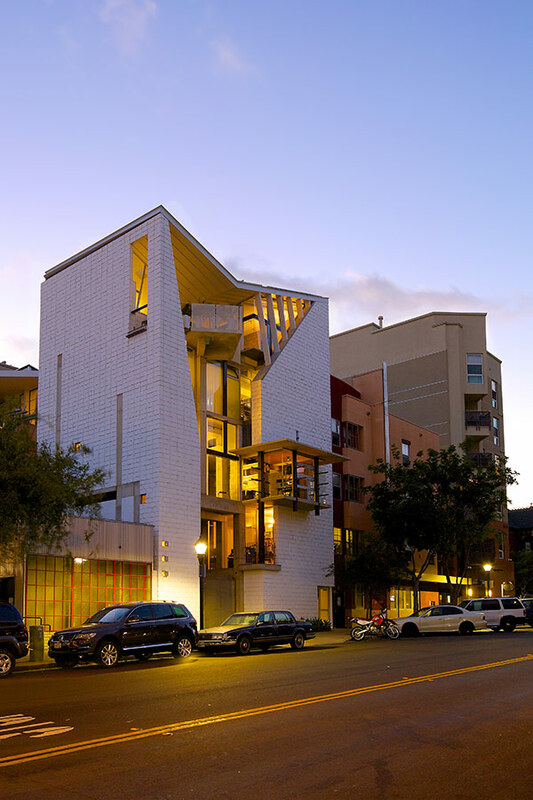 To keep within the budget, the architects only used the stone on the public areas of the exterior—lower on the elevation and around the entrances—while using similarly colored, split-face CMU on the building’s back ends and higher up on the elevation. This sort of playing with the VA design guidelines characterized much of the rest of the project as well. The guidelines suggested terrazzo in the lobby, for example, but Page found that they could save a substantial amount of money by instead specifying a porcelain tile for the lobby, allowing the architects to spend that savings on more natural materials throughout the interior, such as limestone in the elevator lobby, which is interspersed with vertical glass tile sections evocative of waterfalls—a regular theme throughout the project. 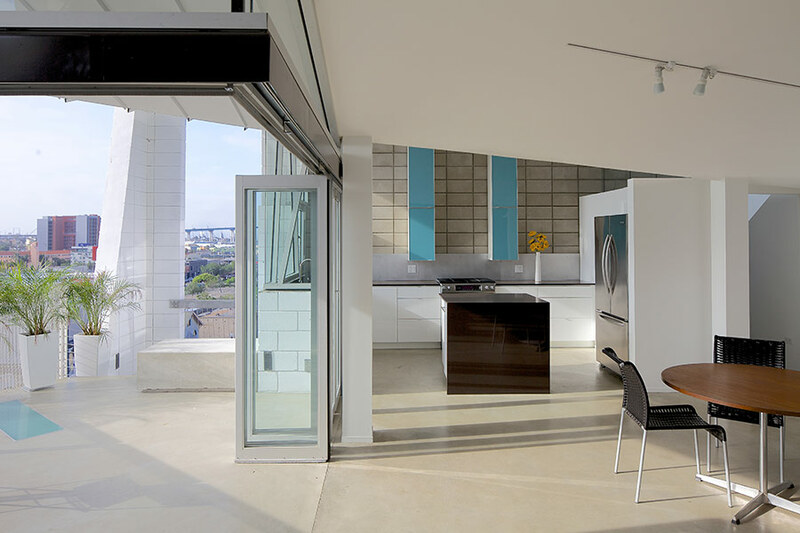 Another challenge that Page faced was bringing as much daylight as possible into the building’s deep floor plates. 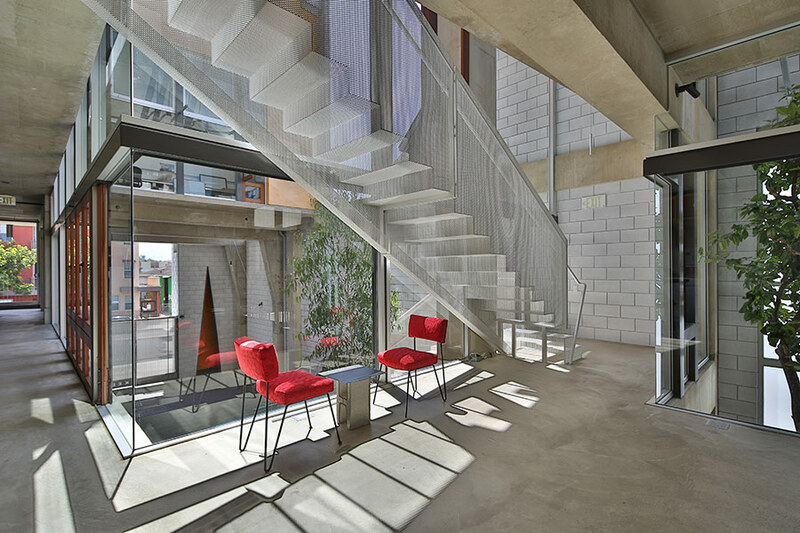 The architects achieved this through two devices. 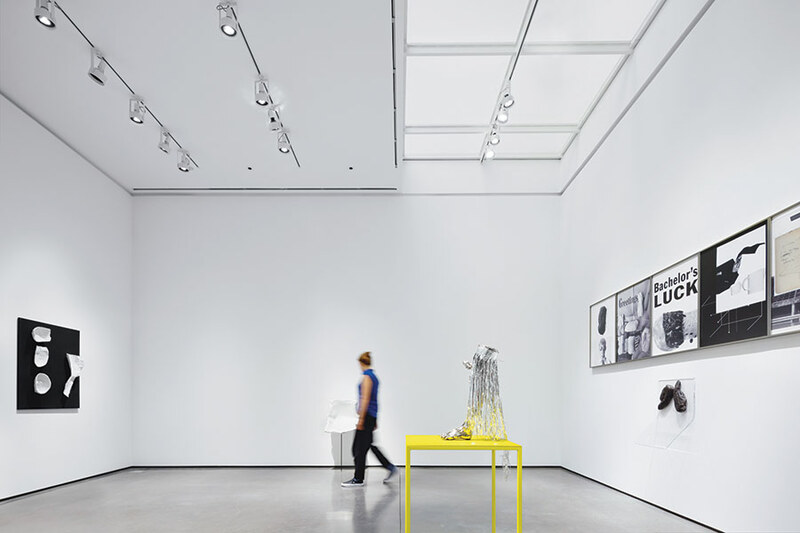 One is a lofty, north facing, glass-encased lobby—hung with a wave-like sculpture by San Francisco artist Daniel Goldstein—that brings sunlight deep into the interior. 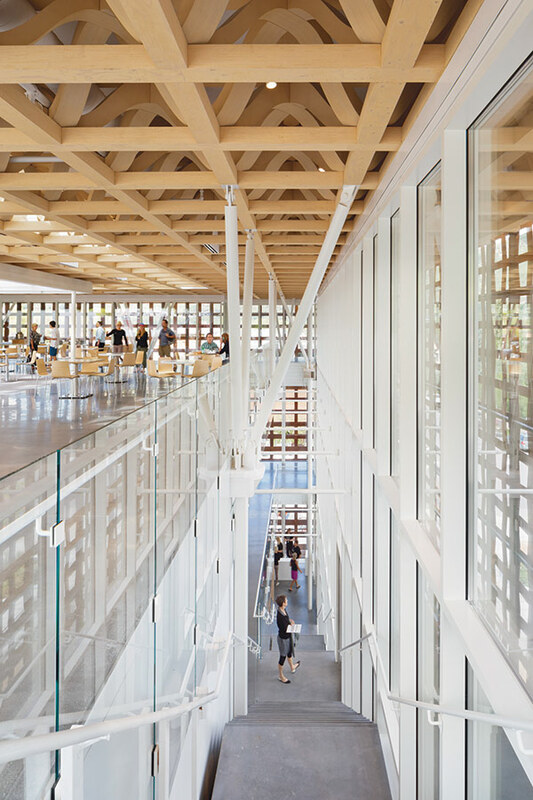 The other is the placement of large windows at the end of each of the building’s long corridors, which set up views to the landscaped exterior from almost any point within the facility. 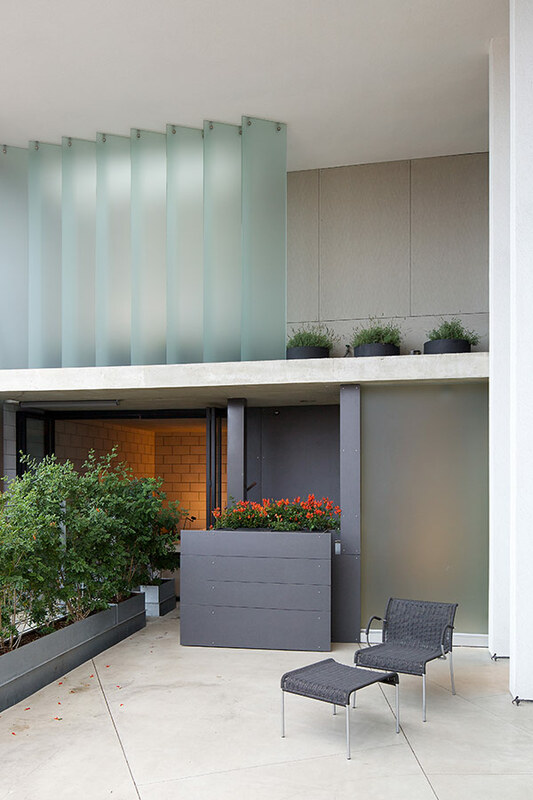 Finally, Page incorporated nature into the project by the most direct means possible—by providing outdoor areas where patients can step out of the air conditioning and experience the weather. 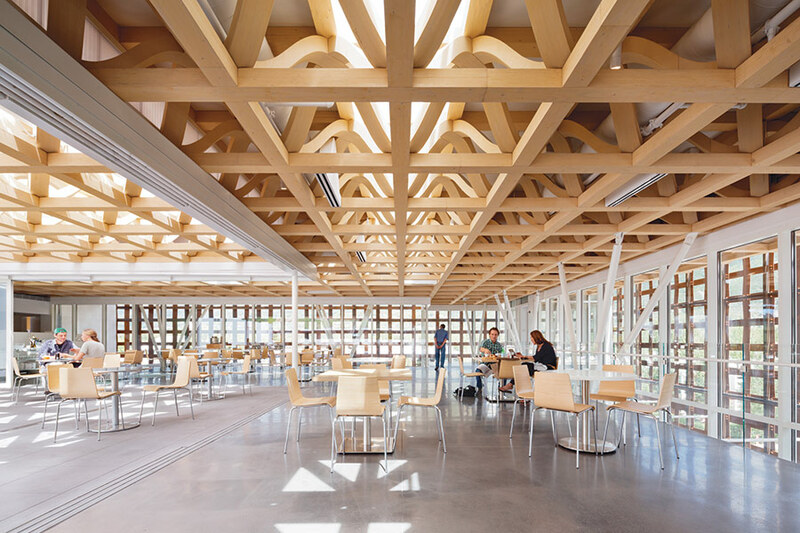 This being Texas, of course, the architects set up shaded tables and pavilions that offer some mediation of the powerful sun. 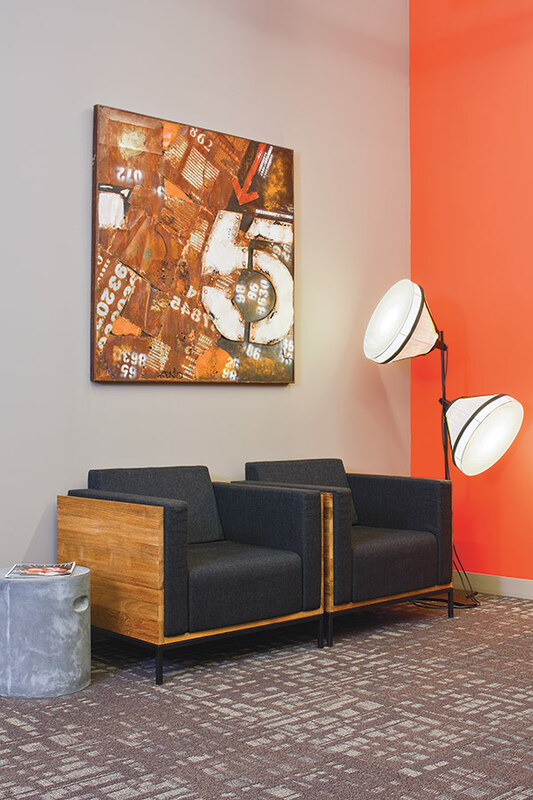 One Medical’s SoMa office feels more like a tech incubator or residential living room than a doctor’s office. 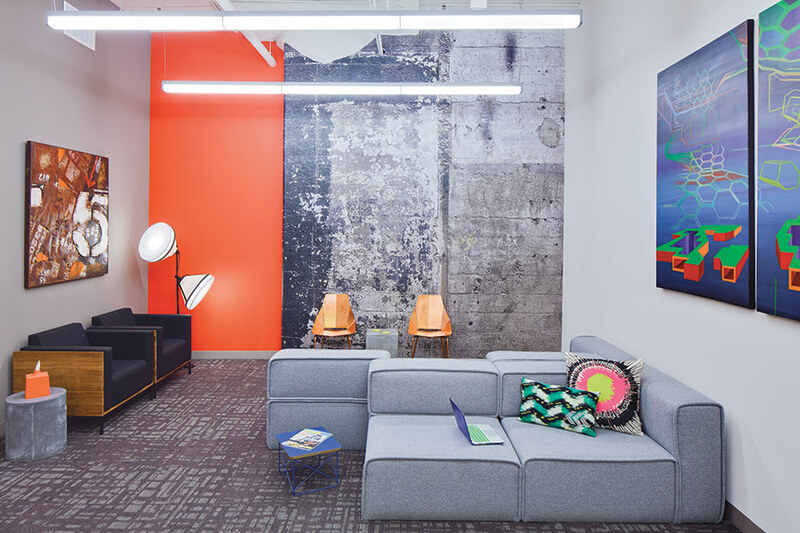 A great example is their office in San Francisco’s SoMa neighborhood, which at first glance looks like the headquarters of one of the city’s many creative tech offices, not a doctor’s office. And for good reason—the space once belonged to a graphic design firm, and that became an instant inspiration for the plan. “We wanted it to almost feel like the graphic design company moved out and the doctor’s office moved right in,” said Granelli. The high-ceilinged space’s rawness and layered textures are especially rare in a medical field obsessed with sterility. 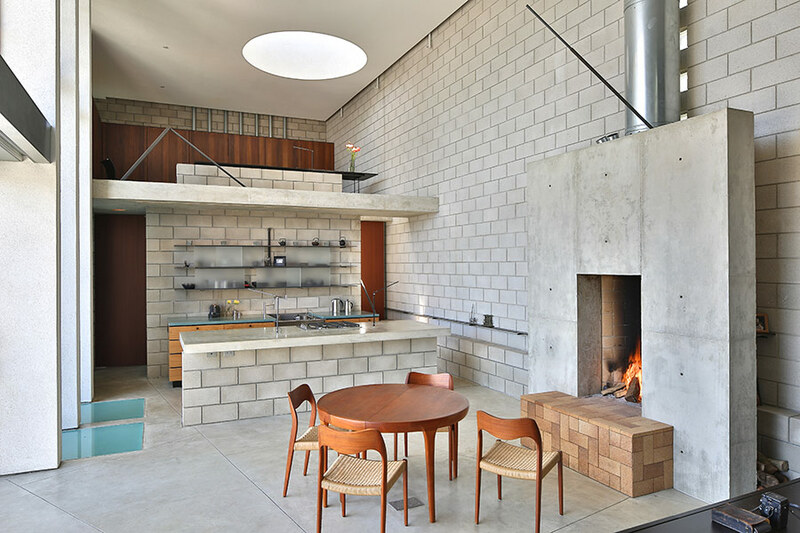 Utilities and wood surfaces are exposed, colorful walls are covered with patterns, and a digital wallcovering gives the illusion of raw concrete. “If we had the opportunity to leave something exposed we did,” said Granelli. Modern furniture contributes to the clean aesthetic, including a modular felt sectional, black form chairs, and geometric copper-clad chairs. Hanging linear lights seem like a closer fit for Square’s or AirBnB’s offices. The front desk was custom milled and topped by a row of hanging, exposed pendant bulbs. 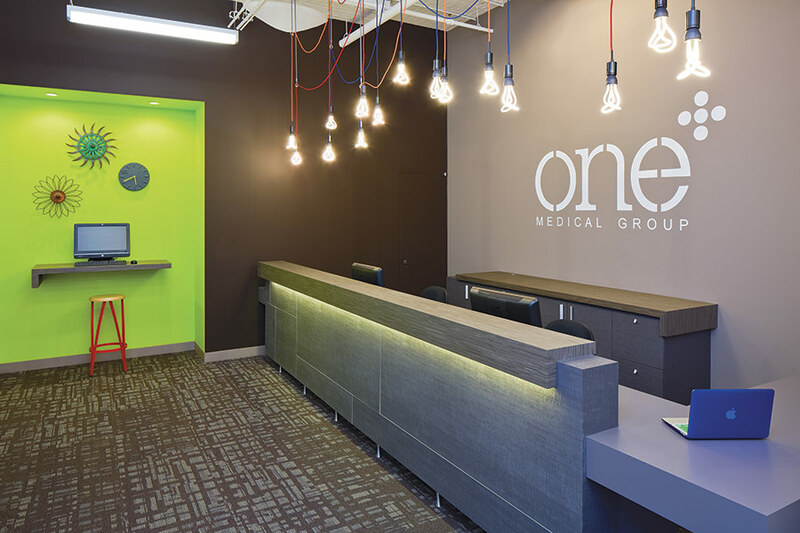 On the wall behind the desk the firm had the “One Medical” logo hand painted in a stencil pattern reflective of the previous company’s aesthetic. 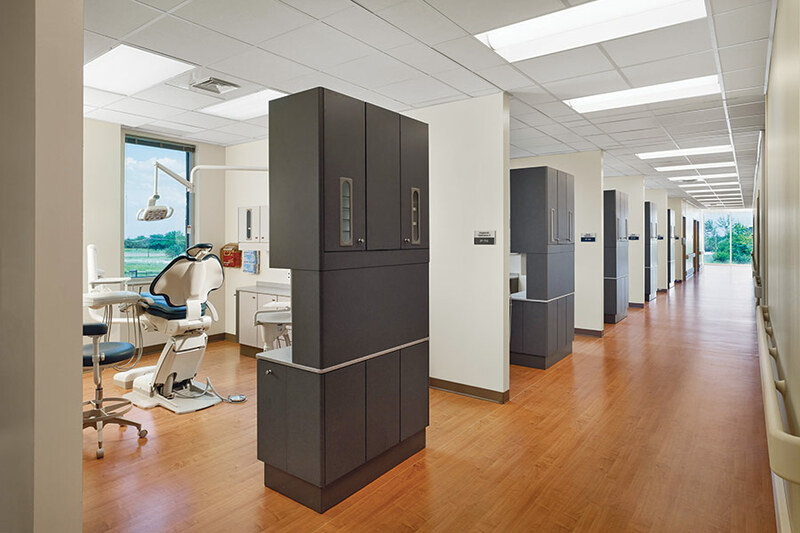 Exam rooms are treated with the same finishes, and, since they are located on the window line, receive plenty of natural light. “Making the space welcoming and comforting hasn’t always been a priority in this field, but that’s changing,” said Granelli. Each location is unique to its context, so the tech startup look in San Francisco is replaced, for example, by a space more similar to a high-end retail boutique in Beverly Hills. “We try to take into consideration not only the city and neighborhood, but the tenant space itself. 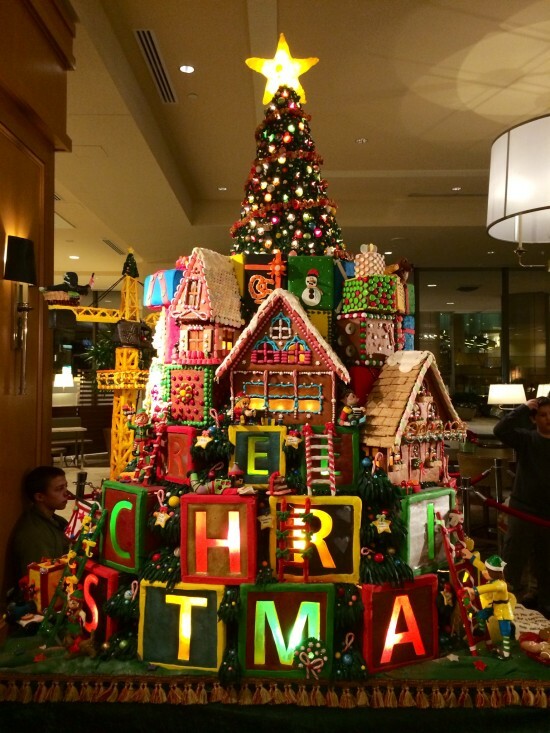 That helps us keep the design elevated,” added Granelli. The majority of the I-345 debate has focused on removing the highway. Why aren't we seeing any proposals for creative reuse? Once or twice a week, a few friends and I will make the short hike to Deep Ellum for dinner, beers, concerts, or whatever else we’re currently lacking in downtown Dallas. There’s something exciting about walking east on Main Street where the city begins to disintegrate, almost literally. All of a sudden the I-345 overpass rises noisily, almost violently, as our dream for mobile freedom rings aloud. Beneath the thundering slabs and girders, a cathedral of concrete and steel spans for quite some distance. Of course it’s not always so sacred; there’s broken glass, rocks, vagrants, and any other urban insecurity one might experience, even cars. 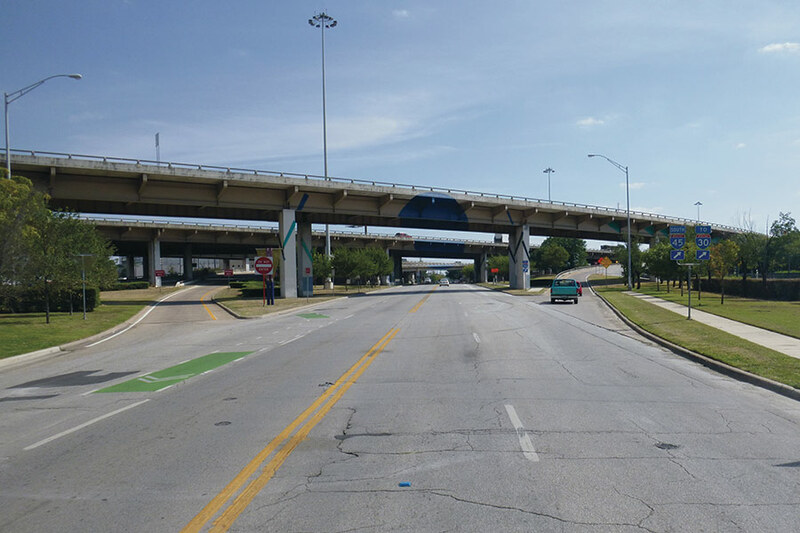 Still, I-345 stands as a symbol of our Dallas heritage, an Oregon Trail for those seeking individualism in the invented places of Richardson, Frisco, or Irving, especially ones simply passing through. 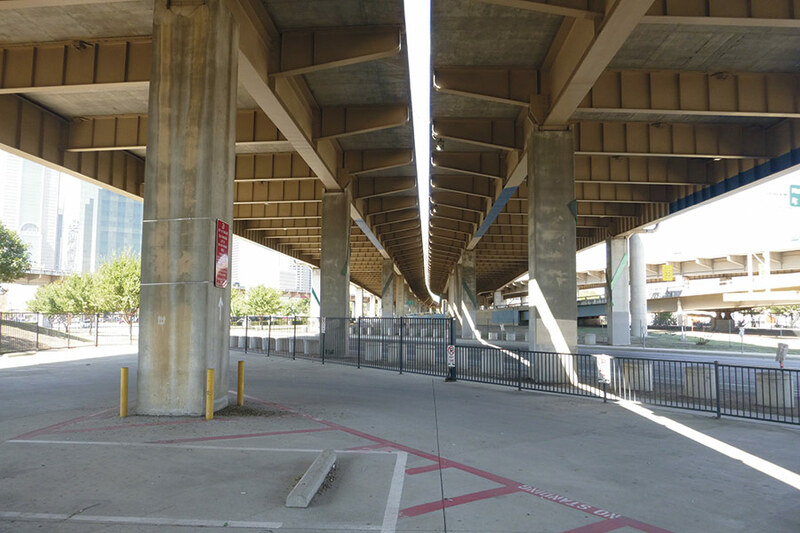 With the city awaiting additional pricing from TxDOT to repair or demolish the elevated highway, and pending information from the varied politics at play, it could all be gone much sooner than we think. Real estate groups, developers, city planners, and bloggers have initiated a coup to blow it up, ready to light the fuse with each opposing hesitation of its removal. In their defense, the argument for tearing down the mile and a half stretch of highway, which connects I-75 to I-30 and I-35, and revitalizing nearly 250 acres of prime real estate is largely legitimate—and has been well tested in such cities as San Francisco, Portland, Toronto, and Milwaukee, to name only a few. On the other hand, the projected successes ($4 billion in improvements, $110 million in annual tax revenue, and 25,000 new residents in the downtown area) contain similar consequences of gentrification and relocation similar to those warranted by highway construction, only this time disguised as walkable streets, small businesses, community, or the idea of urban living. As most in Dallas will remember, Victory Park also was marketed as a diverse, hyper-pedestrian dream. 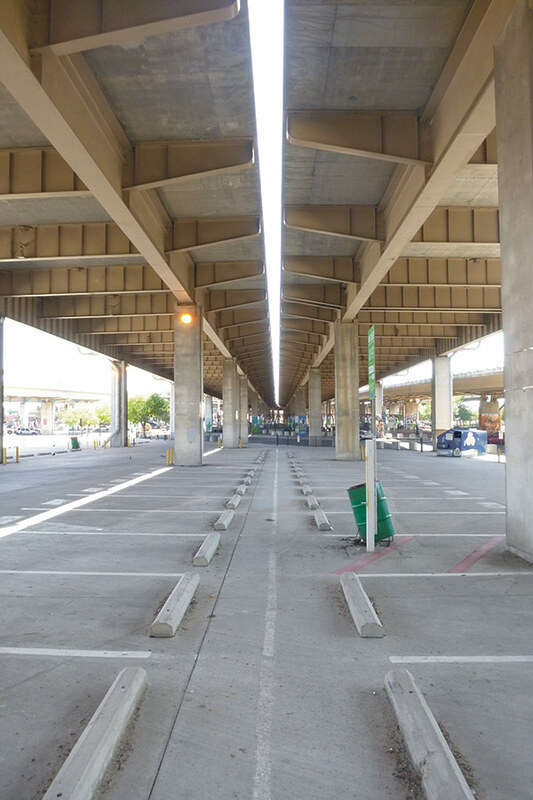 Absent from the predictable highway removal conversations about investments, bonds, and alternative routes of transportation, are ideas for saving the existing highway infrastructure and formal organization, as a catalyst for design. That’s right. What if we didn’t tear it down? Why has so little been offered in the way of reusing the existing infrastructure for developing unique models of urban development; allowing new and existing structures to create something worth having. New is not always better, contrary to popular Texan belief. If anything, such a disposable mindset is far more dangerous. Remember that this conversation is about more than cars and money, as difficult as that may be. This debate is about the inevitable clash between the Baby Boomers and the Millenials, and the desire for new individual freedoms, for a creative and useful urban resurgence. If there is a pent up demand for identity, proximity, and amenity, then a resourceful built environment plays an imperative role in defining it. There is an opportunity here to break free from quantifiable residential and commercial consumer models, New-Urbanist ideals, and gentrified enclaves for the privileged. In order to reform our isolated desires, an acceptance and cultivation of a common history must occur. While the architectural history of Dallas may not be as rich as, say, Boston, it doesn’t make its metropolitan infrastructures any less significant. To replace I-345 with another Uptown would be an insulting and unsustainable blow. What about a park large enough to effectively exercise in? What about affordable housing, public restrooms, baths, gardens, markets, or theaters? Isn’t there something more valuable and dramatic in the natural reconciliation of generational histories? Piece by piece, in parallel with the divine opportunity of chance, such a montage is worth investigating, no matter the cost. Do what you want with the skin. Keep the bones. Kresge Auditorium by Eero Sarinen at the Massachusetts Institute of Technology, Cambridge, Massachusetts. Twentieth-Century Building Materials: History and Conservation is a compilation of papers sorted into seven parts: metals, concrete, wood and plastics, masonry, glass, linoleum, and roofing, siding, and walls. When first published by the National Park Service in 1995, it was one of the only references on the topic. That same year, the Historic Preservation Education Foundation in collaboration with the National Park Service organized the first national conference on the topic, Preserving the Recent Past, from which a series of papers emerged. This was followed in 2000 with Preserving the Recent Past 2 and its associated papers. Clearly, as mid-century Modernist buildings age, there is a need to better understand the significance of the 20th century in terms of its impact on our built heritage, but also as regards the conservation of its construction materials. These were often experimental in nature, and have now also proven to be less durable. 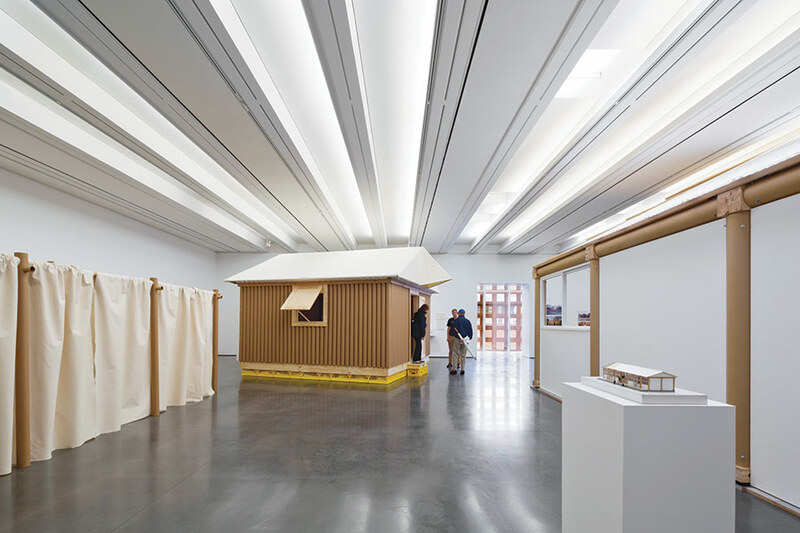 With the acknowledgement of specific 20th-century structures as heritage, there also arise questions of ethics and philosophy of treatment, given the fact that there is typically a wealth of archival material, and the buildings were well photographed. In addition, the original designers are more likely to still be alive or recently deceased, so there tends to be a lot more information about 20th-century heritage than other periods. 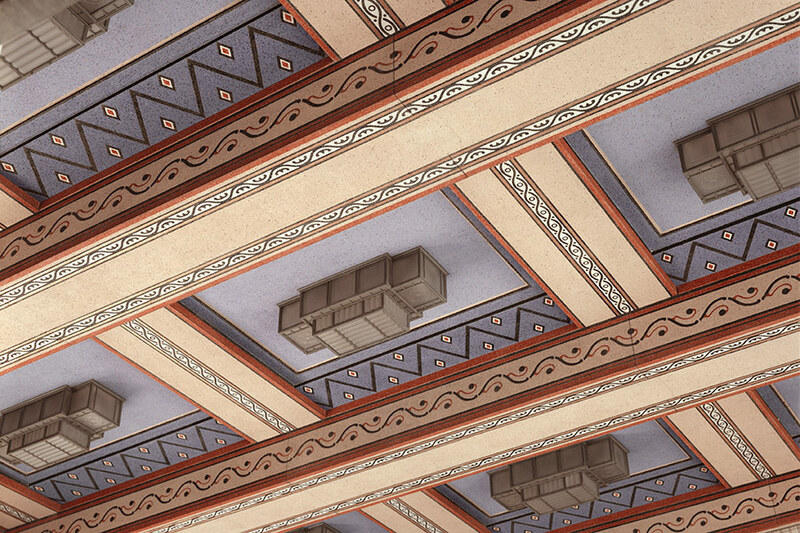 Polychromatic lobby ceiling (1934, John J. Early) of the Department of Justice building, Washington, D. C. (left). 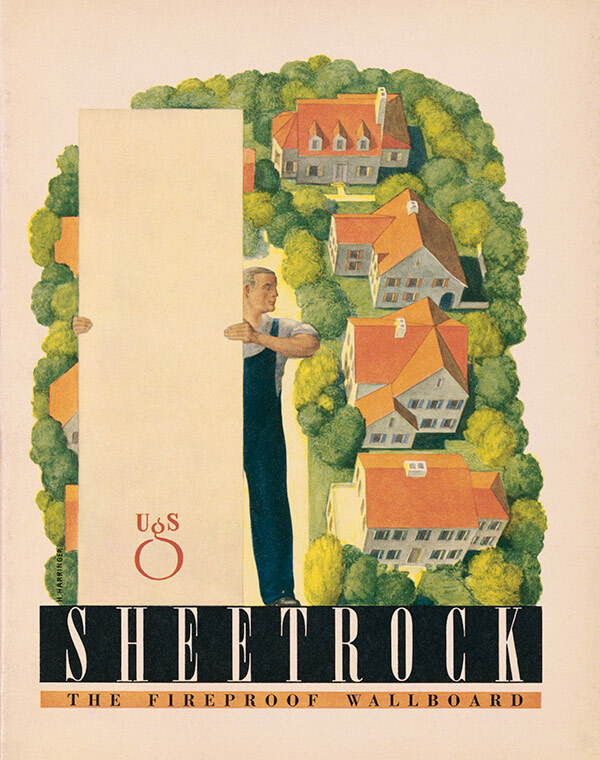 Sheetrock: The Fireproof Wallboard, United States Gypsum Company, 1937 (right). Since the mid-1990s, when this book was first published, several factors have resulted in an increased interest in the built environment of the 20th century. First is age. 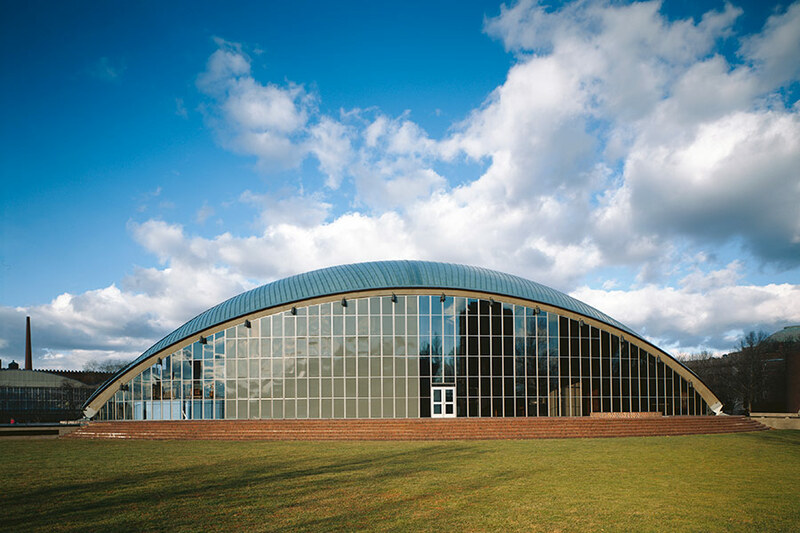 Most of these buildings are approaching 50 years or older, enough time and distance to create a new appreciation for the aesthetic and technical achievements of 20th-century architecture. 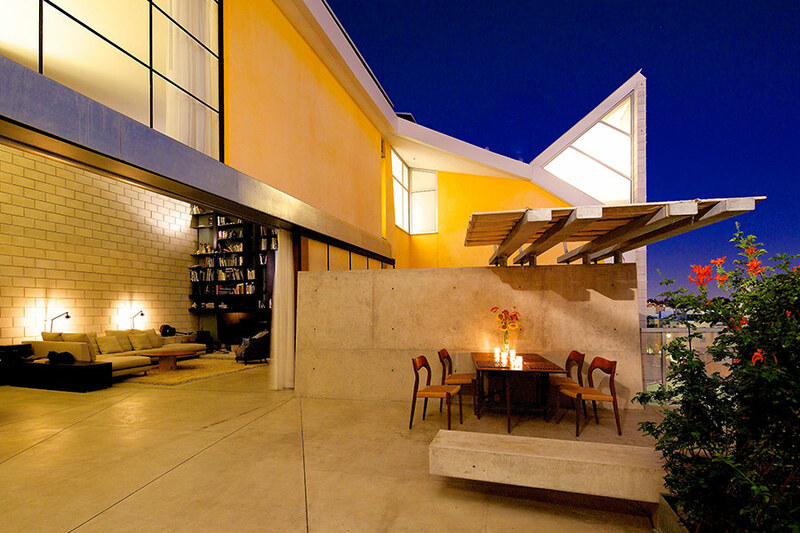 Second is the failure of the materials used in modern architecture, requiring maintenance or replacement. Third is the rise of organizations and initiatives focused on 20th-century heritage. Docomomo (Documentation of the Modern Movement) was founded in 1988 in the Netherlands, and has chapters around the world, as well as annual international conferences and a journal. The International Committee on Monuments and Sites (ICOMOS) formed its International Scientific Committee on 20th-Century Heritage (ISC20C) in 2005, which has held annual symposia and published papers ever since. The Association for Preservation Technology International (APTI) has had for some time a Technical Committee on Modern Heritage, and published a special issue of APT Bulletin devoted to the conservation of modernism (Vol. 41, 2010). The World Heritage Committee has highlighted the gap in designation of 20th-century heritage, and as a result several important sites have been recently included on the World Heritage list. 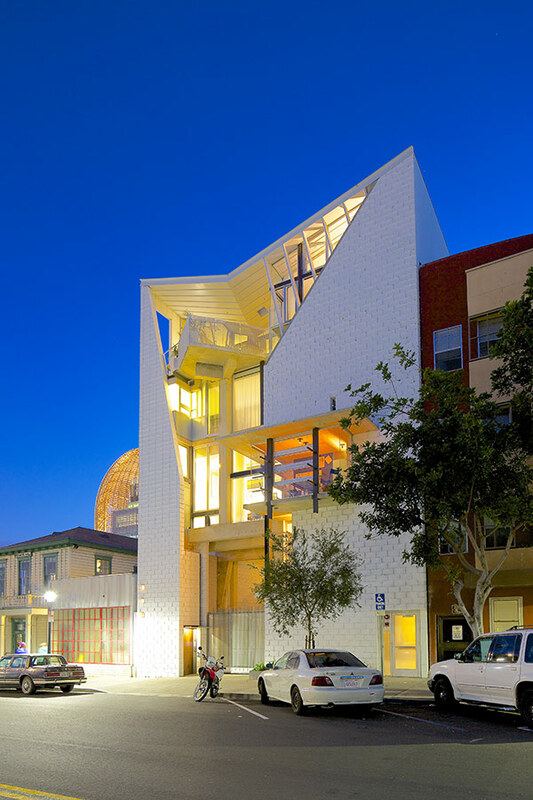 And since 2011, the Getty Conservation Institute (GCI) has become involved through their Conserving Modern Architecture Initiative (CMAI), which organized an expert colloquium in March 2014. The GCI has long had a counterpart program focused on modern materials conservation in artwork. 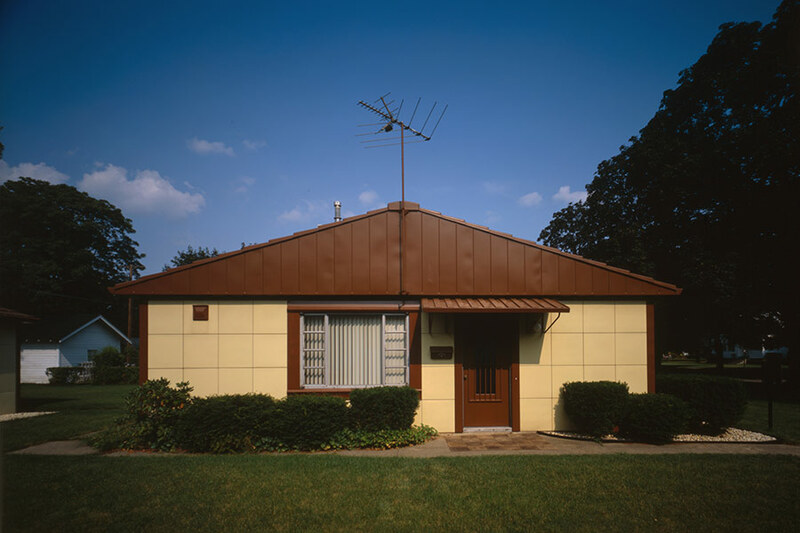 Prefabriaction Lustron house (1950, Morris Beckman) in Chesterton, Indiana. This book, however, remains an important resource, because little research has been accomplished in the nearly 20 years since it was first issued other than the publication of case studies. The book was out of print and has been re-issued by the J. Paul Getty Trust as part of its program to promote activities related to the conservation of the recent past. Although the papers remain the same as the earlier edition, and are not confined to materials of the Modernist Movement, the historical research is still valid, as are the approaches recommended to individual materials and their conservation. The papers’ authors are mostly still very active in the field and some are now considered authorities on the topic. Beginning with Metals, the papers cover aluminum, monel, nickel silver, stainless steel, and weathering steel. Under Concrete, concrete block, cast stone, reinforced concrete, shotcrete, architectural precast concrete, and pre-stressed concrete are discussed. Wood and Plastics includes fiberboard, decorative plastic laminates, plywood, glued-laminated timber, and fiber-reinforced plastic. The section on Masonry covers structural-clay tile, terra cotta, gypsum block, and tile, thin-stone veneer, and simulated masonry. For Glass, there are papers on plate glass, prismatic glass, glass block, structural glass, and spandrel glass. The Flooring section contains articles on linoleum, rubber tile, cork tile, terrazzo, and vinyl tile. Lastly, Roofing, Siding, and Walls covers asphalt shingles, porcelain enamel, acoustical materials, gypsum board, and building sealants. In addition, there is an extensive bibliography and sources for research. The book is well illustrated and indexed. 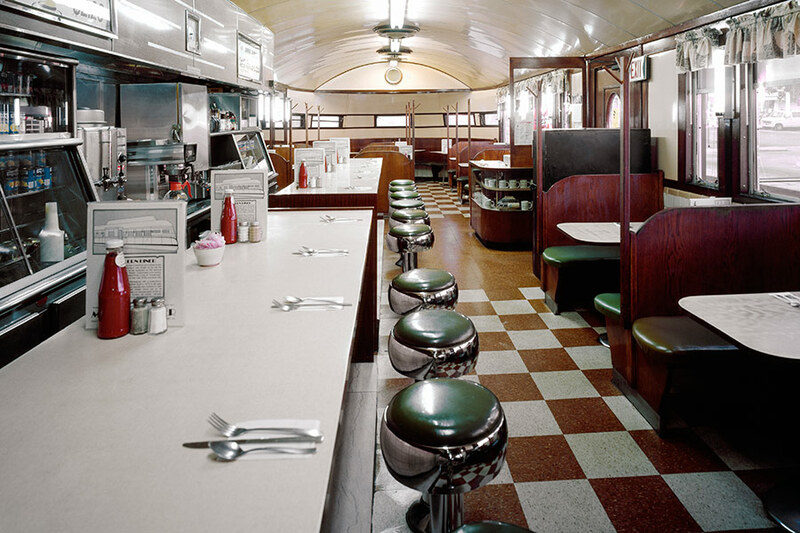 The Modern Diner (1940) in Pawktucket, Rhode Island. Twentieth-Century Building Materials: History and Conservation continues to be extremely useful for architectural historians and researchers, technical professionals involved with the care of the 20th-century built environment, as well as owners and managers of such buildings. It is well written and organized in such a way that it is easy to find information on specific materials. 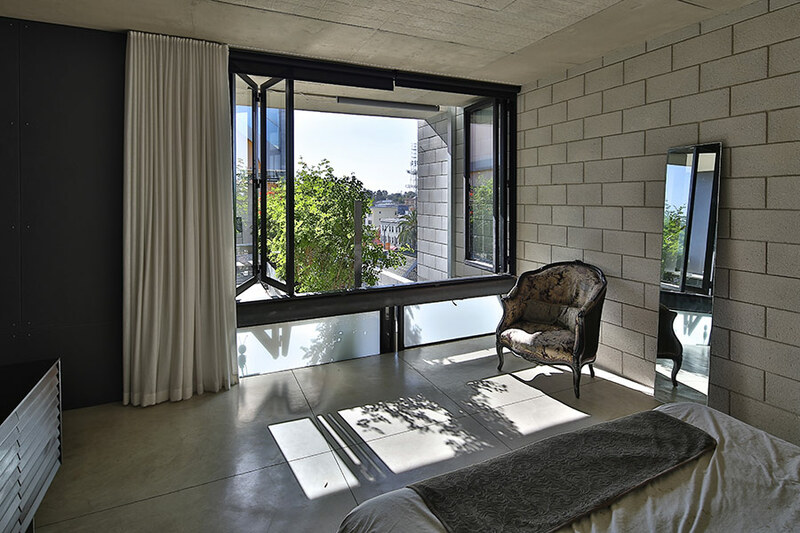 Where it falls short is in the fact that it mainly covers individual components, whereas many of the products used in 20th-century construction are systems—think of glazed curtain walls as an example. Here, those of us who work in this field must rely on our own experience or review of similar case studies. But the problem with case studies is that they tend to be published soon after they are implemented, and if over time the interventions fail, the authors almost never re-evaluate and publish the failure. The book’s other shortcoming is the lack of discussion on philosophy and ethics of intervention, although, as the title claims, the book is focused on history and conservation. Still it is important to acknowledge that technical solutions should be based on programmatic strategies that involve some thought about the philosophy of preservation for a given site. 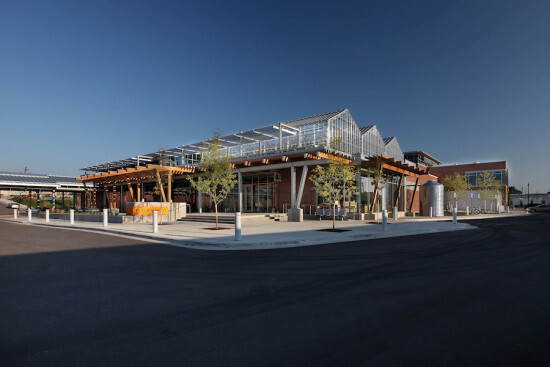 In cities around the U.S., train stations are being converted to multi-modal transit hubs anchoring impressive new neighborhoods, and private developers are cashing in. John Gendall rides the rails to skyrocketing real estate prices. One of great rites of passage for most Americans, from baby boomers to Generation Y, was the trip, often on a sixteenth birthday, to the Department of Motor Vehicles to get the first driver’s license. But research from automotive data company Polk shows the share of car purchases made by young adults (ages 18–34) plummeted by 30 percent between 2007 and 2011, while the share for adults aged 35–44 fell by 25 percent. Younger Americans, it would seem, are not as eager to get licensed up at the soonest opportunity. Not only has this sent carmakers scrambling to render the driver’s seat with all the trappings of a smartphone—the commodity that young adults actually do covet—but it has also instigated a series of land use trends that are reshaping American cities, and train stations are taking center stage. “Teenagers and young adults aren’t even getting driver’s licenses,” said Amtrak chief of corridor development Bob LaCroix, “These trends are making our stations very interesting to the real estate community.” ‘Interesting’ would be one way to put it. ‘Potentially very lucrative’ would be another. 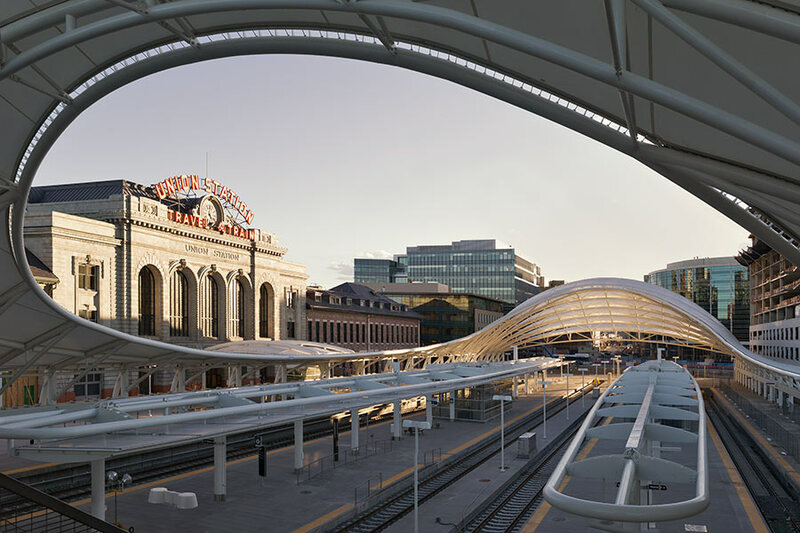 Opened this summer, Denver’s revitalized Union Station has stimulated urban development in its surrounding areas as well as along the transit lines that feed into it. Real estate prices near the station have jumped from around $435 per square foot to $600 per square foot. New Yorkers will be familiar with this effect from Hudson Yards and Atlantic Yards, where the Related Companies and Forest City Ratner are, respectively, developing on the formerly uncovered rail yards of Penn Station, in Midtown, and Atlantic Terminal, in Brooklyn. But in cities across the country—Denver, Salt Lake City, Minneapolis, Miami, Philadelphia, San Francisco, Seattle, and Los Angeles—developers and municipalities are making serious investment in transit and transit-oriented develompents. “Every major metro area in the country, really, is doing a pretty substantial build out of its transit systems,” said Rachel MacCleery, Senior Vice President at the Urban Land Institute (ULI). Since developing suburbs by the swath is becoming less tenable for economic and environmental reasons, municipalities and developers are more tactically considering land use within city centers. 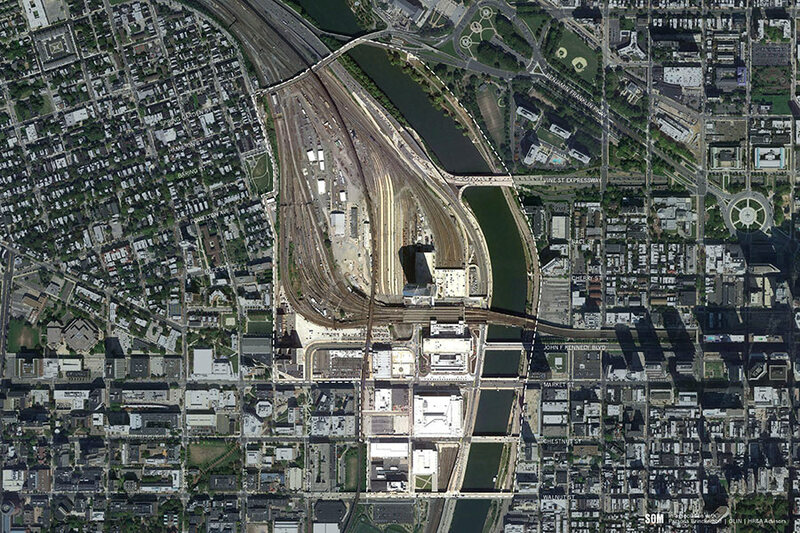 In Philadelphia, for example, the main train station, 30th Street Station (which happens to be the third busiest station in Amtrak’s system) is ringed with significant real estate anchors: the University of Pennsylvania, Drexel University, and, just across the Schuylkill River, City Hall, the Philadelphia Museum of Art, and the Center City district. Though the station itself is an impressive historic structure and though it has this orbit of vibrant neighborhoods, its immediate context leaves something to be desired. One local architect, who wished to remain unnamed, called it “the hole in the middle of the donut.” Amtrak, which owns the station and over 80 acres of rail yards, including—and this is important—the air rights over them, is teaming up with neighbors Drexel University and Brandywine Realty Trust to develop a comprehensive master plan for the station and its context. To do this, Amtrak tapped SOM, Parsons Brinckerhoff, OLIN, and HR&A Advisors in May 2014 to undertake the two-year planning process. 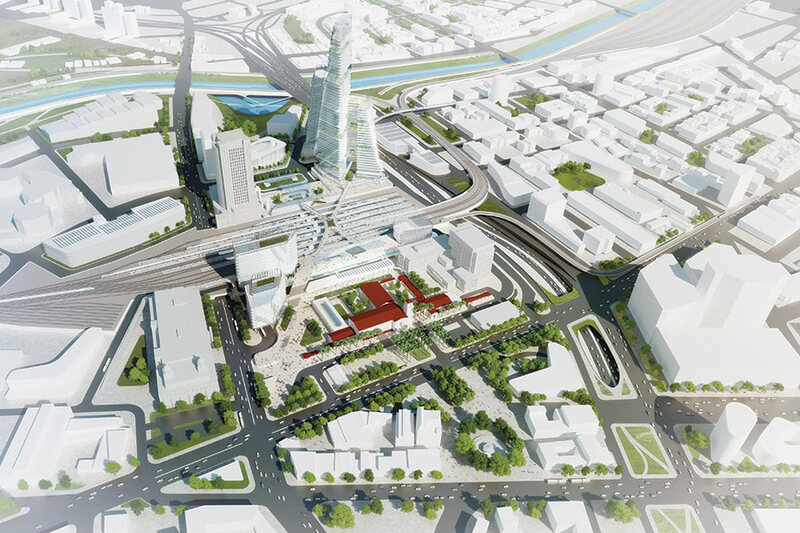 Plan for a new Los Angeles Union Station. 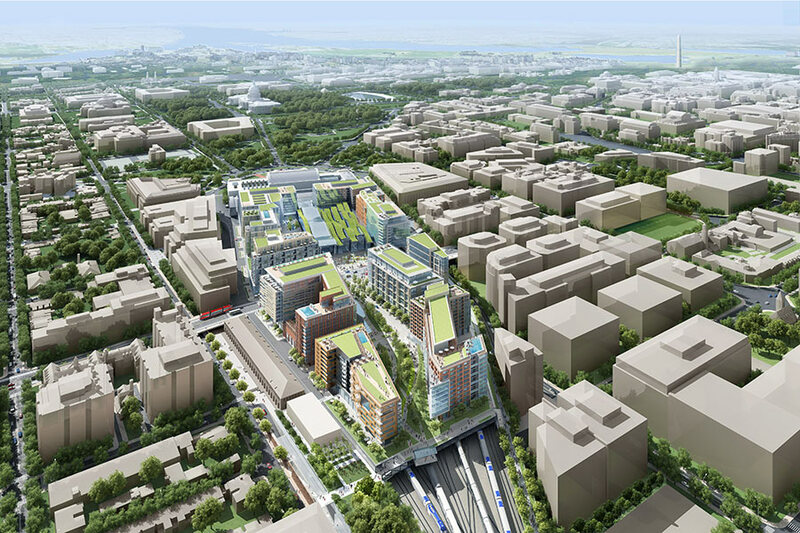 Real estate professionals and transportation advocates point to Washington DC’s NoMa district as a particularly compelling precedent. Close to Union Station, the area, once dominated by parking lots and warehouses, had long suffered from high vacancy rates. In 2004, though, an infill transit stop was added to the Washington Metro commuter rail line, instigating a surge of real estate activity. 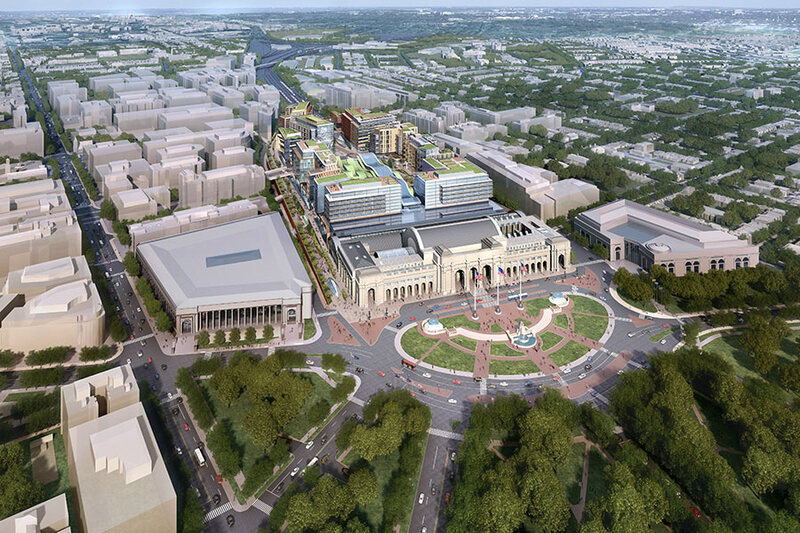 Now, Washington is looking to build on that success with a redevelopment of its Union Station. Working with the Union Station Redevelopment Corporation, the U.S. Department of Transportation, Maryland Transit Administration, Virginia Department of Rail and Public Transportation, and the Washington Metropolitan Area Transit Authority, Amtrak engaged Parsons Brinckerhoff and HOK to author a 15-to-20-year master plan that will triple the passenger capacity in the station, double the train service, and plan for real estate development on and around the station. 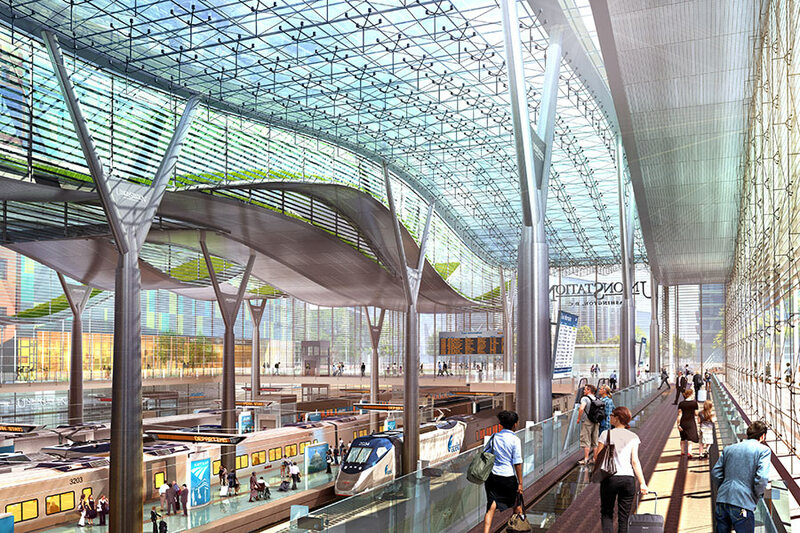 For Washington D.C.’s Union Station, Amtrak hired Parsons Brinckerhoff and HOK to author a master plan that will tripple passenger capacity, double train service, and plan for real estate development around the station. 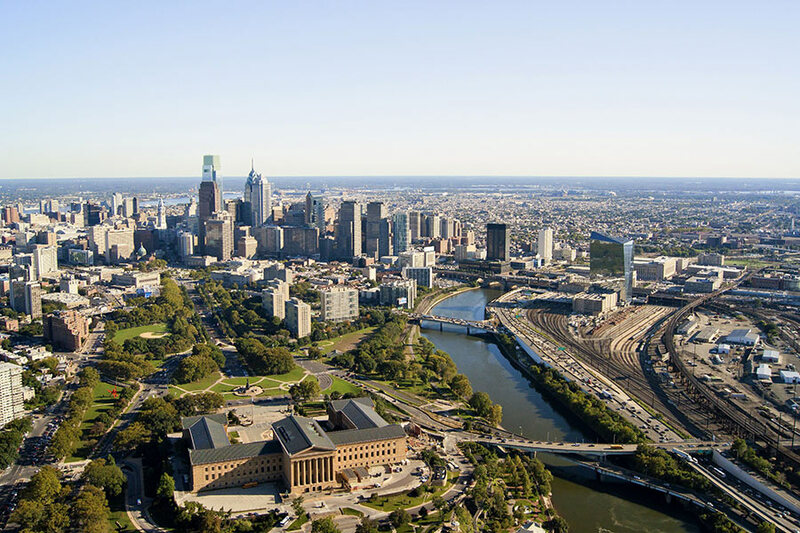 Amtrak has partnered with Drexel University and Brandywine Realty Trust to develop a master plan for the area immediately surrounding Philadelphia’s 30th Street Station. Cases abound of historically preserved train stations that contribute little to community and economic development. 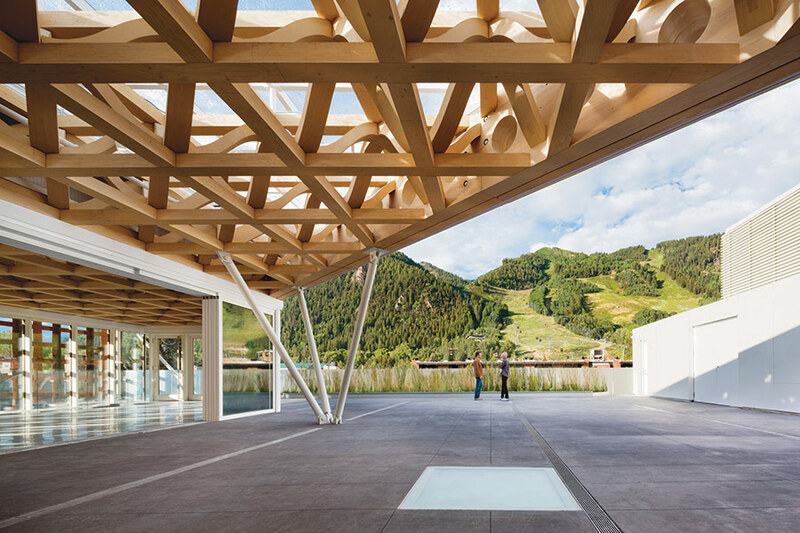 What these cases demonstrate is that architectural attention on the station itself needs to be coupled with a serious commitment to the underlying transportation infrastructure. While the historic restoration of Seattle King Street Station was a critical element for the success of the project, that alone was not sufficient to anchor the neighborhood. The city and its transit agencies have committed to investing in transit and undertaking the gritty, long-term work of transforming the historic building into a multi-modal hub, orchestrating heavy rail, light rail, and local and regional buses. Cutting the ribbon on its transit hub this summer, Denver Union Station has become an important model for other transit-related developments. 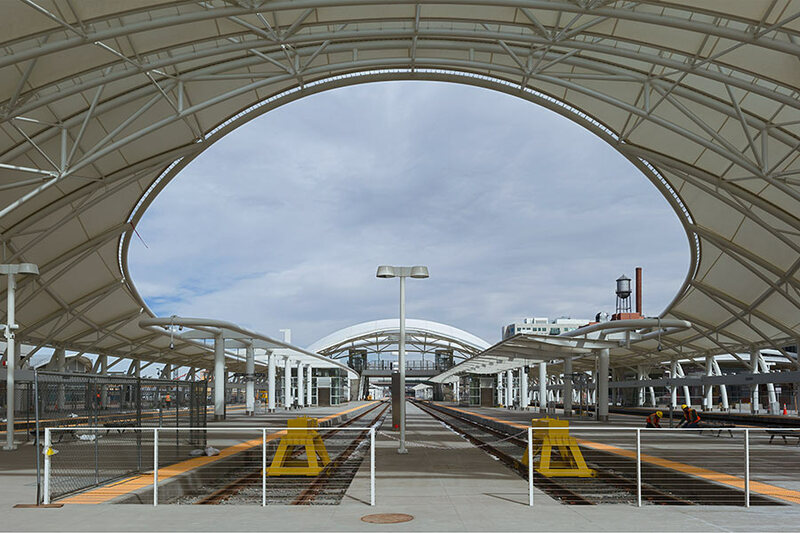 Having effectively reshaped the metropolitan experience in Denver, the project has stimulated urban development both at and around the station itself, but also along the network of transit routes that the station catalyzes. The Denver Union Station Neighborhood Development Company, a joint entity between developers East West Partners and Continuum Partners, has essentially shifted the city’s center of gravity toward the train station, which, for decades, had been dangling on the margins of Denver’s downtown area. The project included the historic preservation of the station itself, a robust public investment in transit, but also a real commitment to neighborhood building. Where Amtrak passengers once looked out onto acres of dusty landscape is now in the midst of becoming over five million square feet of commercial, residential, and civic space spread over nearly 20 acres. Several restaurants and a new hotel opened this summer. A Whole Foods is on the way. “It’s an incredibly complex station, but we’ve created a neighborhood, not just a transit station,” said Chris Frampton, a managing partner at East West Partners. 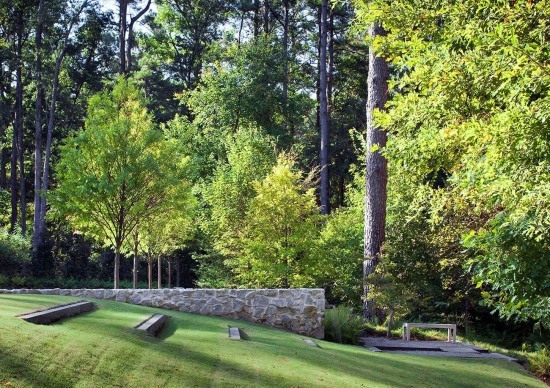 Private developers play a fundamental role in realizing these transformations. “We typically seek developers through competitive processes,” said LaCroix, acknowledging that Amtrak is not in the best position to build neighborhoods. “When transportation agencies do the developing, they do it wonderfully, but they do it for trains,” said Frampton, making the case for private development to help in making neighborhoods. This is not just an act of civic altruism. “The marketplace is paying,” said MacCleery. In Denver, where the property leases had peaked at $435 per square foot, East West and Continuum recently leased One Union Station at $600 per square foot.